As the homeless population grows, more homeless encampments are popping up wherever people can find the space: sidewalks, woods, empty lots, under bridges, and along train tracks, waterways, and walking paths. The number of people in these encampments can range from a single tent to a community stretching for miles and if you’re the property owner when they’re cleared out, it’s your responsibility to make sure the refuse of what’s left behind is properly cleaned up. 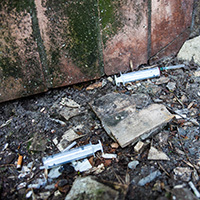 Here at Rocky Mountain Biohazard, we have years of experience working with property owners, police, first responders, and government agencies to clean up the refuse left behind in homeless encampments. Our fast and thorough staff are discreet and ready to get your property quickly cleaned up and safe to use. Mitigate Your Liability – Do Not Let Your Staff Clean It Up! With no plumbing or garbage pickup, trash stockpiles in a homeless encampment, creating the perfect environment for diseases to breed, ready to infect anyone who comes into contact with them. These diseases include Hepatitis A, B, C, E. coli, HIV, and MRSA. Any one of these diseases are extremely dangerous and difficult, if not impossible, to cure. Among the trash of rotten food, soiled clothing, and other assorted junk, are also pests such as rats and fleas, along with numerous bio hazards including dirty hypodermic needles, leaking battery acid, and human and animal feces and urine. Any time these bio hazardous materials are present: blood, vomit, chemicals, bodily fluids, and human excrement, companies and property owners must follow strict guidelines determined by OSHA regulation 29CFR1910.1030 which requires employees to have comprehensive and thorough training on how to deal with, clean, and properly dispose of such materials. Without this training, business owners are held liable for any damages incurred. With 24/7 availability, call Rocky Mountain Biohazard today to mitigate your liability. Call Rocky Mountain Biohazard today to discuss your particular situation and to schedule a free estimate. All calls are confidential and you will speak directly with the owner 24/7 to determine how we can help.